Good evening!! This is Kanae from SAKURA HOTEL JIMBOCHO!! We had a Jogging event on 3rd!! On that day, Daiji and I cooked meals for the first time!!!! Sorry, this is our first time to cook for event so we were concentrating on cooking. Please forgive us about looking downwards? The jogging start at 7:30pm normally. ＊What? you can't see any meals?? Sorry just we forgot to take pictures. We did cook!! I think we just didn't give meals to guests!!!! I will try to cook well and quickly!!! 【イベントリポート】7月14日ハワイアンフェアレセプションパーティー！にご参加いただいた皆様ありがとうございました！【Event Report】Thank you for joining our Hawaiian Fair Reception Party last night ! Last night we had Hawaiian reception party at sakura hotel jimbocho. Many people joined our event !! MAHALO?Thank you !!! We have decorated our cafe into Hawaiian Tiki Style ! We will be serving many Hawaiian dishes ! Also we will be serving Blue Lychee Shaved Ice during our fair period ! popular Hulihuli Chicken Leg will also be in our menu as well! There are more than these menus, you should really come and check this out ! From today which is July !!! 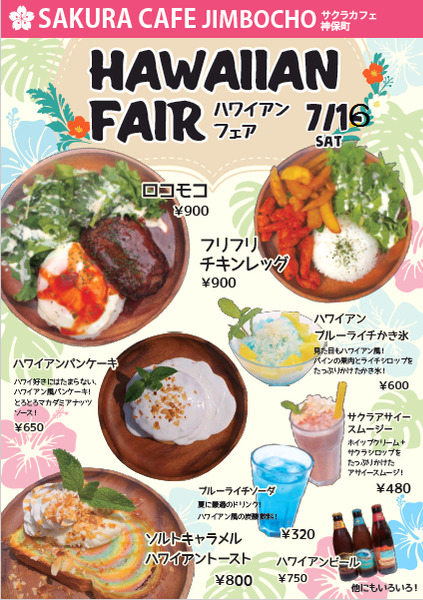 Finally, this month the Hawaiian Fair starts from the 16th so do not miss it !!! Waiting for you to come to sakura cafe jimbocho !! Hello~~This is Kanae from SAURA HOTEL JIMBOCHO. They came to watch Baseball game in Tokyo dorm!! *Our hotel is just 20 minutes on foot from Tokyo dorm!! and the team also won!!! Yeah!!!! Hawaiian chocolate and cup noodles!!!! The cup noodle is Japanese company's I guess. I wanna eat!! AND don't forget our Hawaiian fair from 16th!!! Good evening ! !This is Kanae from SAKURA HOTEL JIMBOCHO. today, let's get to know more about HAWAII!! There is 19 hours difference of Hawaii and Japan. Japan is in the future. which is one size larger than Iwate prefecture(It is second largest prefecture in Japan), 15,279 km 2. Hawaii Island is almost the same as 10,432 km? Gifu prefecture. And the area of ? ?Oahu is 1,545 km 2, which is smaller than the smallest prefecture Kagawa prefecture in Japan (1,877 km 2)!! Do not touch the sea turtle...If you touch, you have to pay a fine!!!!! <span lang="en">The public area is All No smoking!!!! I would love to go to Hawaii. Russian plate also gave us!! Thank you soooo much!! anyway, We are glad to find it!! Thank you for staying with us. Safe trip!! Are they very much alike?? Yes, They are sister from Turkey!! Grandfather is 87 years old!!! I couldn't believe that. He is so healthy...and nice grand sun!! Our hotel is nice place to International Exchange!! Hope to see you again and Take care of yourselves everyone!! 【グランド・オープン】姉妹店のサクラホテル日暮里がオープンしました !ご予約を早めに！グランドオープニングセール実施中！【Grand Opening 】Our new branch Sakura Hotel Nippori just opened a few days ago ! Opening Sale is ON ! Be Quick and get the cheap rate ! Sakura Hotel Nippori is located near both Sendagi and Nishi Nippori station ! Walk-able distance of course ! All the rooms here are Japanese Style Tatami Room, if you want to feel Japanese culture, this is your best option ! There are many good spots to explore around Nippori, also the access from the airport is great ! Temples are nearby, also Shopping Street is nearby as well ! They are doing Grand Opening Sale at the moment, please be quick and get your great room rate right now ! We held the Meet-up run around the Emperor Palace two days ago, on Thursday evening. Many people participated in it. Thank you very much. 夜のランも、朝ラン同様、すごく気持ちいです。 Evening run is as great as Morning run. You can see beautiful night scenery if you look up when you are running. これを見ると、疲れが吹っ飛びます。You forget tiredness if you see it. 終わった後は、みんなで、お食事会です。After running, we held a party. We hold the evening run around the Emperor Palace every Thursday (Meet at 7:15pm). Please come to join us! Today, we walked to Kudanshita, and then we ran around the Emperor Palace. Weather was fine, and the scenery was great. We felt so good. 走った後は、パーティを開きました。After we ran, we held a party. こんな感じの朝ランニングを開催しています。This is the 'Morning running' event which we hold. みなさんも今度参加してみませんか？ Do you participate in it next time? Hello!! This is Kanae from SAKURA HOTEL JIMBOCHO. それでは!Thank you for reading.Have a g0od night! Enjoy a variety of events at Sakura Hotel! You can do the party in the Sakura cafe. We're also going to hold St. Patrick's Day party on March 10th Friday! Click here to see the details! and you can eat as much as you want! We starts to serve it from 4:30 AM everyday!